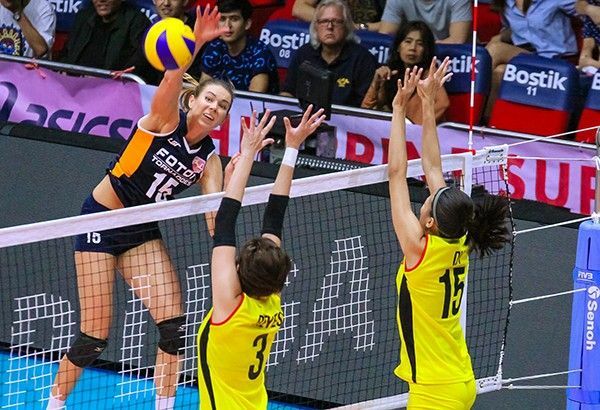 MANILA, Philippines – After numerous battles on the court, F2 Logistics’ team captain Cha Cruz is thrilled to have Lindsay Stalzer as teammate. The pretty open spiker from De La Salle University said they are excited to have Stalzer as import when they campaign in the Philippine Superliga Grand Prix starting this Saturday at the Ynares Arena in Pasig City. Stalzer could be an asset. After leading Cignal, the former Illinois star led Foton to back-to-back titles before teaming up with Hillary Hurley in Petron in 2017. The Blaze Spikers fell short of winning the crown as Maria Jose Perez of Venezuela and Kennedy Bryan of the United States powered F2 Logistics to a dramatic come-from-behind victory in their best-of-three title showdown. The following year, Stalzer returned and joined Katherine Bell in dethroning the Cargo Movers in a very convincing fashion. But with Petron reaching an agreement with Bell and Stephanie Niemer in the off-season, Stalzer was left unsigned, prompting the Cargo Movers to tap her to serve as reinforcement together with Italian-American Becky Perry. And it sets the stage for another blockbuster and dramatic battle between two of the best club teams in the country today — Petron and F2 Logistics — in their first meeting on March 7 at the Filoil Flying V Centre in San Juan. Cruz said it’s going to be a war. “If I’m not mistaken, this is her sixth time to play in the league,” she said. Perry, on the other hand, is excited to team up with Kim Fajardo, arguably the best playmaker in the country today.